In 2017, Washington, D.C post-punks Priests announced themselves to the world with, despite the claims for the contrary, a big bang. After years of struggle and toil on the legendary D.C punk scene, the quartet of Katie Alice Greer (vocals), Daniele Daniele (drums), Taylor Mulitz (bass), and G.L. Jaguar (guitar) put their creative heads together and came out one of the best debut records of the decade Nothing Feels Natural. There's an urgency to their debut that still remains prevalent two years on with tracks like "JJ" or "Pink White House" or the title track which fizzed with energy like an exploding soda can. In the subsequent time, however, the band had to restructure due to the amicable departure of Mulitz, who now fronts Flasher, which reportedly Greer claims was "the death of that version of Priests." If their follow-up, The Seduction of Kansas is anything to go by, then it's clear Greer was not exaggerating. 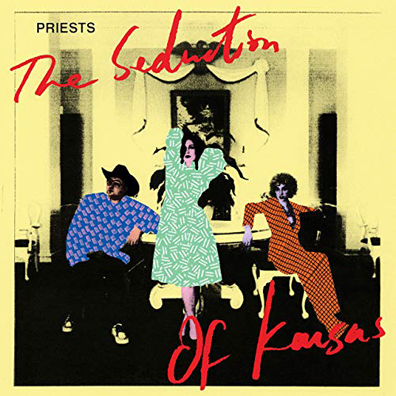 While this is still recognisably Priests, the band have taken on the role of '80s post-punk revivalists, building a moody, reverb-soaked, atmospheric version of their former selves, to mostly positive results. Opener "Jesus' Son" gives proceedings a well-needed kick, suggesting, initially at least, that perhaps things haven't changed so much in the Priests camp. The lead single and title track, however, showed more of a sign of what's to come here on Kansas with a methodological, industrial sounding track helped in essence by producer John Congleton (Angel Olsen, St. Vincent). "Youtube Sartre" keeps the band's frenetic pace going, whereas later tracks "Good Time Charlie," "Control Freak," and "Carol" keep the band's well-observed energy up.